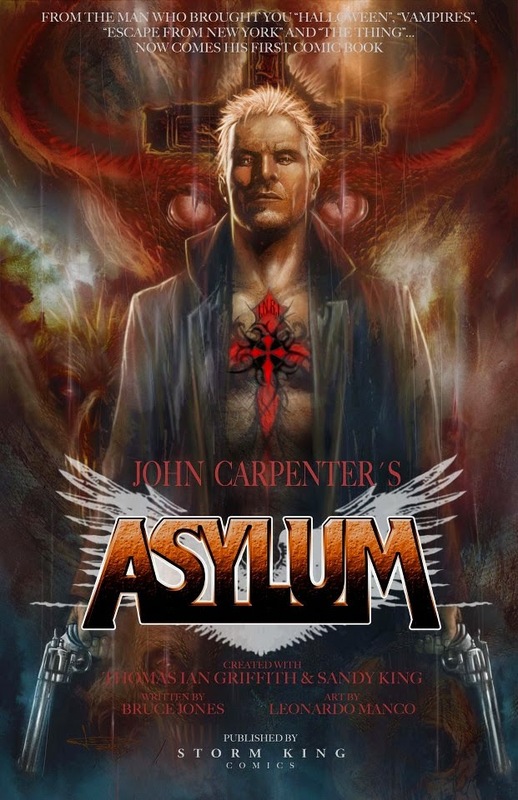 Storm King Productions announced today the graphic novel release of their six issue horror comic series John Carpenter's Asylum. There will be three versions of the book, including a limited run collectors' edition, only available through the publisher, a hardcover edition (ISBN 978-0-9853258-8-6/SEP141622) in time for the holidays, and a softcover version (ISBN 978-0-9853258-7-9/AUG141656) that will hit stores in October. Writer, publisher movie producer Sandy King Carpenter (They Live, Vampires) and renown artist Leo Manco (Hellblazer, The Girl with the Dragon Tattoo, Driver for the Dead) will be on hand at New York Comic Con for signings and autographs at booth #2029. The soft cover at the show will be $19.99. The November hardcover release will be $35.00. he limited edition version will be $100.00 and available for purchase on-line and advance order at the show. The softcover NYCC release will be a full 200 pages which contain the 144 comic pages from the first six issues as well as a sketchbook from Leo Manco that shows pages in the three different stages of development (pencils, inks, colors), a “how to”guide covering the creation of the John Carpenter's Asylum animated trailer, and three new demons never before seen in the comic! The hardcover will have the same interior, which includes one of two limited edition sketch cards. The limited edition includes an oversized slipcase hand numbered with signatures by Sandy King Carpenter, John Carpenter, Leo Manco, Bruce Jones, Trent Olsen, Janice Chiang and possibly Thomas Ian Griffith. The run will be strictly limited to 500.